The new generation of dimmable PCA ballasts from Tridonic provides even more options for fixture manufacturers and users. With new digital interfaces, sensor functions and memory functions the devices meet all the requirements for dimmable light and open up countless possible applications. Dornbirn, Austria – The new PCA product range comprises three series: EXCEL one4all, ECO and BASIC. Tridonic offers these three series so that customers have a choice of technical features in clearly defined packages. The aim is to provide fixture manufacturers with precisely the functionality that they need for their products. The greatest potential energy savings with lighting systems come from automatically adjusting the dimming level according to the amount of freely available daylight. With the new xitec II generation of processors, Tridonic ballasts enable daylight sensors and motion sensors to be directly integrated, so they can react to the presence or absence of people and the available ambient light. A long series of intelligent functions enables energy to be saved continually and effortlessly. These functions include economical lamp operation, optimum filament heating at every dimmer setting, low power consumption on standby and automation for corridors, storage rooms and car parks. New lighting systems can be created thanks to high-quality plug-and-play solutions with the SMART interface and the versatile programmability of the EXCEL one4all series. The focus here is on simple installation and uncomplicated connection to lighting systems. 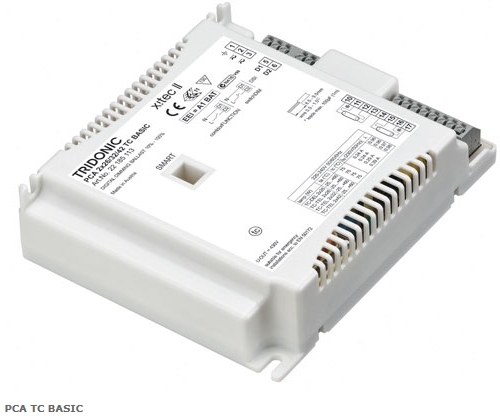 To ensure intuitive commissioning, all Tridonic ballasts are equipped with a multi-functional interface. The new generation ballasts support the digital DSI standard, and the devices in the ECO and EXCEL one4all series also support the DALI communication protocol. In addition to the digital standards, they also support simpler methods of control such as switchDIM (control via conventional switches) and corridorFUNCTION (control via conventional motion sensors). A special feature of the PCA series is that each control version is wired via the same connections. The device detects the control version and automatically switches to the appropriate mode. Flexible dimmable lighting systems can therefore be put into operation very quickly and without the need for any additional aids. The PCA BASIC series is already available. Its functionality is designed to save energy. 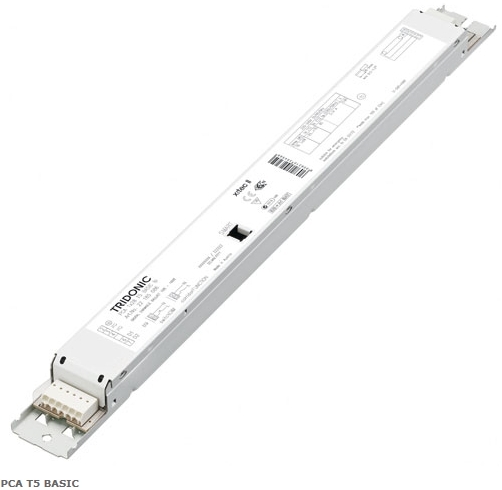 These ballasts have been developed for simple dimming applications. They offer defined dimming functions and dimming values. To do this, they make use of tried and tested DSI and switchDIM technology. The ballasts also support the corridorFUNCTION in its simplest form. With the SMART-Plug cF modules there is also a choice of three preprogrammed profiles for the corridorFUNCTION. The SMART interface also enables PCA BASIC ballasts to offer constant lighting control with the plug-and-play SMART 5D sensor. The portfolio of the PCA BASIC series covers all the usual lamp types (T5 HO and HE, T8, TC-L, TC-F, T5c, etc.). It also supports special types, such as amalgam lamps and energy-optimised T5 versions. Ballasts in the PCA ECO and PCA EXCEL one4all series will be available in February.